If you have been dreaming about catching a smallmouth bass that will put a bend in your fishing rod, Lake Mohave is the place to go. The reservoir has long had a reputation for giving up large striped bass, but its reputation as a fishery is about to take a hard turn into smallmouth bass country. On Saturday, my friend Tim Myers boated a jaw-dropping smallie that tipped the scales at an amazing 7.38 pounds while competing in the Nevada BASS Nation Team Trail tournament based out of Cottonwood Cove. That fish took the tournament’s big fish honors and put the Las Vegan Myers and his partner, Jesse Milicevic of Henderson, in the winner’s spot with a five-fish bag that weighed in at 22.21 pounds. The second- and third-place teams weren’t far behind with bags that tipped the scales at 20.72 and 20.57 pounds, respectively, and seem to support Myers’ theory that it is going to take 20 pounds or more to win one-day tournaments on Lake Mohave. That’s an average of 4 pounds per fish. Further evidence might be found in the results of a Southern Utah Bass Anglers tournament held over the weekend at Katherine Landing. First place went to a team that weighed in 40 pounds of fish. The tournament’s big fish weighed in at 6 pounds, 2 ounces, nearly breaking the reservoir’s record for smallmouth bass. Six others topped 5 pounds. 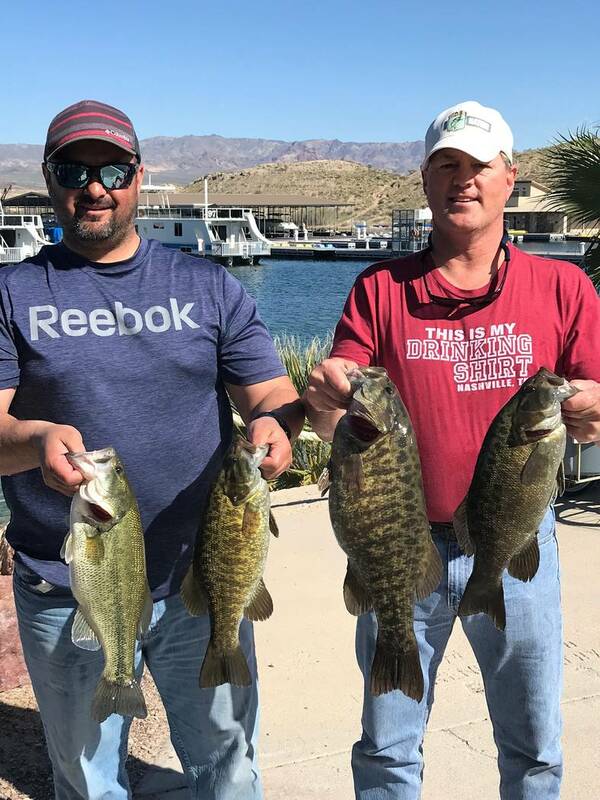 If Myers chooses to enter his fish in Nevada’s Trophy Fish Program, and it meets the certification requirements, it could best the current Lake Mohave record for smallmouth bass by nearly a full pound. 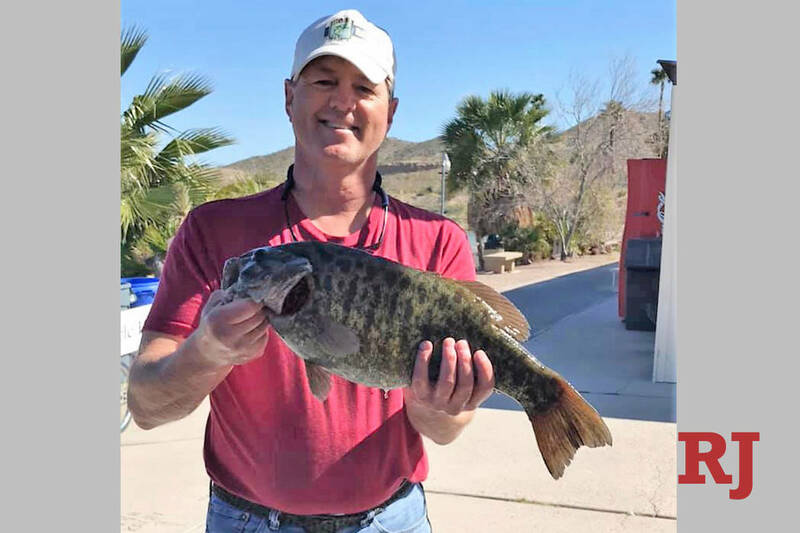 A four-year-old record that currently belongs to Christopher Couch of Las Vegas and the 6-pound, 4-ounce smallie he caught at Mohave in April 2015. Given the increasing number of smallmouth bass tournament anglers are weighing in that top 5, 6 and now 7 pounds, I wonder if it would be a stretch to suggest the reservoir will one day give up a new state record? That spot is currently held by an 8-pound, 11-ounce fish that was caught at Sheep Creek Reservoir in 2010 by Curtis Ockerman of Meridian, Idaho. So, what makes Lake Mohave such a productive smallmouth bass fishery? Mike Burrell, now a retired fisheries biologist who spent more than 20 years on Lake Mohave, once told me that habitat is the key. At Mohave, pockets of bass habitat were created as water from the Colorado River rose behind Davis Dam after it was completed in 1953, inundating patches of Mesquite trees, other desert vegetation and rock outcroppings. Through the years, I have had the opportunity to fish Lake Mohave, but perhaps more importantly to talk with experienced anglers who have spent years hunting bass in those pockets of habitat. To an angler they all have stressed the importance of that structure. Not only to the reservoir’s bass population but also to their overall fishing experience. As importance as that structure is, a quality fishery also needs a good population of forage fish, and Mohave has that as well. The reservoir has abundant populations of bluegill, green sunfish and shad. While the predator-prey relationship between bass and the bluegill and sunfish is obvious, the forage fish do more than fill the bellies of hungry bass. Burrell thought that by eating bass fry, the bluegill and sunfish limit the number of bass that reach maturity, which then reduces competition for available forage and allows the surviving bass to reach larger sizes. Whatever the recipe is for growing large bass in clear desert lakes, Lake Mohave seems to be stirring the ingredients together just right. One can’t help but wonder how long we must wait before a lucky angler reels in the reservoir’s first 8-pound smallie. The 55th Annual Fraternity of the Desert Bighorn fundraising banquet will take place May 18 at the South Point Hotel. The Fraternity specializes in building and maintaining wildlife water developments. For details and tickets visit www.desertbighorn.com . Also on the agenda is the South Las Vegas Friends of the NRA annual fundraiser. The banquet is slated for April 6 at the Palace Station. This non-political organization raises money to fund projects that advance the shooting sports. For more information call 702-308-8038. Freelance writer Doug Nielsen is a conservation educator for the Nevada Department of Wildlife. His “In the Outdoors” column, published Thursday, is not affiliated with or endorsed by the NDOW. Any opinions he states in his column are his own. Find him on Facebook at @dougwritesoutdoors. He can be reached at intheoutdoorslv@gmail.com.